Following surgery to remove a parotid tumor on the left side of my face, I suffered symptoms of nerve and muscle impairment that presented like Bell's palsy. Iwas assured, by my surgeon, they were only bruised and not damaged, but would take time to recover and advised face exercises. My recovery was painstakingly slow and as time lapsed, I became frustrated and disheartened at my progress. On a visit with my primary care physician, he thought physical therapy would hasten recovery. Ginger Physical Therapy offered what I needed. Dr. Merryn Mathew had such a positive outlook and her energy, knowledge and focus, allowed me to see drastic improvement almost immediately. The support Dr. Mathew has provided with her attitude, positive reinforcement and understanding, has been very instrumental in my recovery and I feel emotionally and physically revived. As I continue my physical therapy, not only has my outlook and attitude become positive, but I am seeing the results. Thank you Dr. Mathew for helping me. Thanks to Dr Lim, I stopped feeling dizzy and can drive and do everything I want to do again. I'm 89 years old and I thought I had a stroke or something. My daughter is a Physical Therapist and recognized the symptoms. She scheduled me to see Dr Lim. After the first session, my dizziness went away. It returned again a few more times but not as intense. Now I'm all good after seeing Dr Lim for a few more sessions. Note: Doctors of Physical Therapy can recognize and differentiate symptoms and treat for VESTIBULAR BALANCE PROBLEMS. Schedule your appointment with WWW.GINGERHEALTH.COM 813-631-9700 today for solutions to your dizziness. If we recognize more serious symptoms, we can refer you to physicians for appropriate treatment. I have finished my physical therapy with your facility. I wanted to first express my appreciation to you and your team. You all have been absolutely phenomenal and have helped me tremendously as I continue to heal. Everyone I worked with was a pleasure and truly made the process as painless *as possible*. I would recommend you to anyone!! …Thank you so much!! Again, you guys are LIFE-SAVERS!! From our patients and families, we are most grateful! Thank you so much for the kind words - We appreciate each of you! 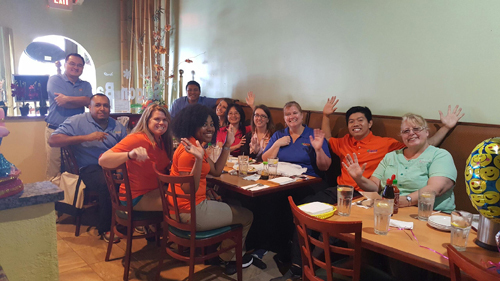 15th Anniversary Staff lunch at Saigon Bay. Fun and Delicious! Thank you for visiting Ginger, Have a Harmonious and Healthy Year!